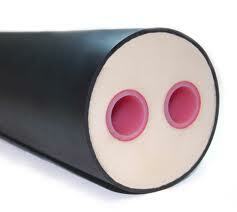 Underground Insulated Pipe- The Good, The Bad, The Ugly Truth….. I have heard that some of the underground PEX pipe companies claim less than 1 degree heat loss in 100’……..please… Let’s take a simple look at this idea and see how much sense it all makes to you. In some cases when you are heating several separate buildings, moving heat between them underground, is necessary. If you must bury your feed and return in the ground, do it right the first time, since digging it back up again is very expensive. 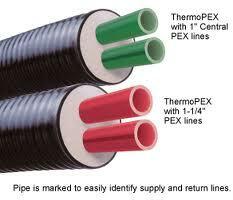 So let’s take a look at what kind of underground PEX pipe is available. Consider this; even if you live in Georgia, the soil temps in the winter are within about 20-30 degrees of Montana temps below our frost line. The key is how deep you bury your pipes. In northern climates most folks dig below the frost line for their area. Where I live that is 7’. At 7’ depth the ground pretty much stays in the 50 degree range. See my point? The water lines that feed our outdoor water hydrants are buried that deep so they don’t freeze. When you look closely at underground PEX pipe you’ll find lots of variations. In my opinion, you want the highest R value possible for as long as possible. The ground is a cold damp place and most insulation will become waterlogged and lose their R-values. In most high efficiency wood boiler installs we are looking for as many BTUs per pound of wood as possible. To do this requires that most of the BTUs stay inside the PEX until they arrive where they are most needed. Therefore we use two separate lines, one for the feed, and one for the return. I run them separately instead of all inside one pipe, because it is very hard to insulate the cold return from the hot feed inside one pipe. Of course most outdoor wood boilers are so inefficient, line loss does not matter either. You can save a lot of chopping and wood handling by reducing the amount of BTU loss in your installation. 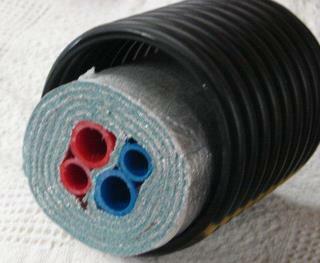 Here are some pictures of various underground PEX systems and what to watch out for. The type of pipe shown has very low R-Value and will lose lots of BTUs. Notice the air space and no insulation between the Feed and Return. This is very bad. Next if you look at this pipe it has more wraps and is better insulated, but still has just one wrap of insulation between the Hot Feed and Cold Return. Still not good as they work to cancel each other out in the end. Your hot feed temps will be much lower as they have been cooled by the cooler return line temps. 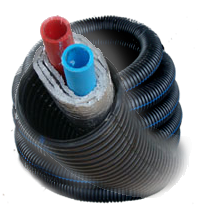 Bury your Feed and Return lines separately using underground pipe like ThermoPEX shown on the right. I like to lay my pipe in a trench that has a layer of at least 2” thick rdgid foam that is about 14” wide and is laid in the bottom before I lay the pipe. I then lay the Feed and Return pipe’s on top of the foam. We then call in an insulation contractor who sprays the entire trench with at least 24” of foam. We then cover it with heavy gauge plastic to shed moisture and bury it. We lose very little BTUs to the soil. I have also done the same thing above ground on short runs that we can enclose with both rigid and spray polyuerathane 2 part expansive foam. This foam can absorb water and it will loose its R value if it gets damp. So it is very important to protect all foam from moisture. It is easiest to keep moisture out above ground. Below ground is always going to be damp and eventually your R Values will drop over time. A simple roof to shed water above the pipe when it is installed above ground works well. I have seen folks build a trough from foam panels and ply wood, lay in their ThermoPEX and fill with Foam beads and closed off. They build a roof over it all and have easy access if they have a problem later on down the road.